The idea of lobster boils and clam bakes has always been a dream of mine. 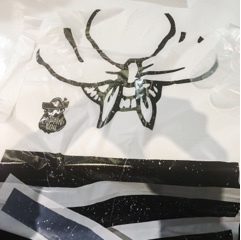 Living in Toronto, it’s hard to partake in the romantic group dining experience that I’ve always envisioned – sitting outside on a picnic bench, the bounty of the sea thrown on a plastic table cloth covered table and everyone grabbing and nibbling while laughing into the early evening air. 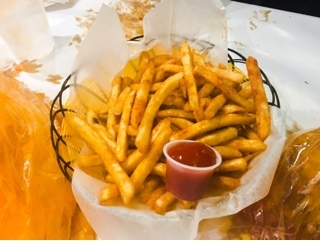 Dining at the Captain’s Boil doesn’t exactly match my vision – you’re inside a cozy two storied building and the bounty arrives in plastic bags that you likely won’t empty onto the table lest you want to ruin the paper tablecloth. Yet, my friends and I were nibbling the night away laughing at what a mess we were making. At the Captain’s Boil, you pick from a variety of seafood (get there early if you want crawfish or Dungeness crab), then choose a seasoning and spice level. There are also a variety of sides and starches on the menu to help you round out the meal. Going with a larger group, we were able to score a reservation (minimum of eight people) and also share more items (since there’s a minimum of a pound per order). For all the seafood, we selected the ‘Captain’s Boil’ spice, which is essentially a combination of all the seasonings (Cajun, lemon pepper and garlic). And for the spiciness stuck with ‘medium’ where there was enough heat to already prompt us for water refills … I can only imagine how strong ‘fire’ would be. 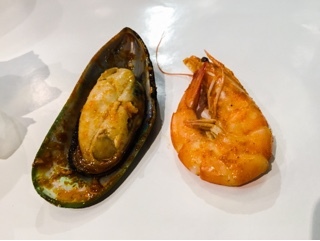 The shrimp ($12.95 per pound) and mussels ($10.95 per pound) are the least pricy options and there were surprisingly a lot of them in a pound – over a dozen for the shrimp and about ten for the mussels. Left with their heads on, the shrimp were able to scoop up more of the cooking liquid which married well with the sweet shrimp. Meanwhile, the mussels were large and meaty, but from the frozen variety so the texture more rubbery than and not as delicate as fresh ones. Although the lobster ($29.95 each) was split in half, if you sharing between more than two people you’ll have to break it apart further. Given the seasoning was so strong, it sort of detracts from the succulent lobster meat. 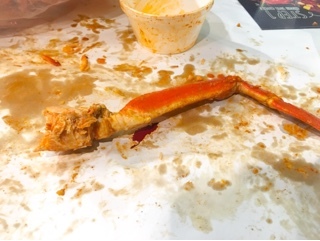 Personally, I found the snow crab ($18.95 per pound) better – for sharing and complimenting the seasoning. Along with the shrimp, it was my favourite of the evening. On the side, the hot juicy corn on the cob ($1 per half ear) soaked in all the cooking liquid. Also, the Cajun fries ($4.95) were freshly made arriving sizzling hot and crispy – very delicious! 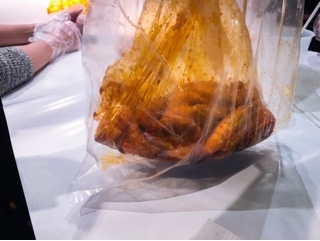 The cooking liquid remaining in the bag can also be enjoyed, garlicky and seeped in the seafood’s essence. The steamed rice ($2) went nicely with it, but hard to share given there were no plates and only one spoon per bowl. In the end, we resorted to making small balls of rice and dipping it into the liquid. Captain’s Boil, please start offering plain toasted baguettes … these would be perfect for dipping. Although the menu offers garlic bread ($3.99), I’d rather have plain bread given the sauce is already so buttery and garlicky. I only wish the dining experience was more environmentally friendly – almost everything used was disposable including the cups and the bags the seafood were served from. A clear plastic bucket to present the seafood in would be better … they could even mix different items together to avoid using too many buckets. 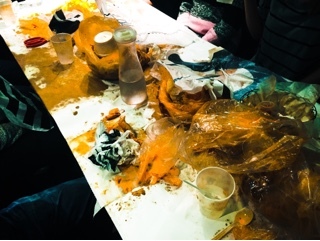 Overall, after the meal our table looked like a crime scene … definitely not the most pleasant looking. But, we had tons of fun creating the site and everything was delicious. Grab some seafood loving friends that aren’t dainty and afraid of some spice. You’re in for a messy but tasty experience.